SMARTSQUARE is an exciting, high-tech protective temporary floor covering that’s perfect for protecting your precious hall floors. It’s also a very safe floor covering for hall users. There’s no bunching or tripping over – SMARTSQUARE gives you a solid, flat, level floor. Originally developed in Europe to protect exotic wooden and marble floors without damaging them, SMARTSQUARE is being used to shield valuable town, school and community and business halls around the globe. SMARTSQUARE allows you to turn your hall into a multi-use venue that can be hired out for events, entertainment, banquets, presentations, seminars, public meetings and concerts. 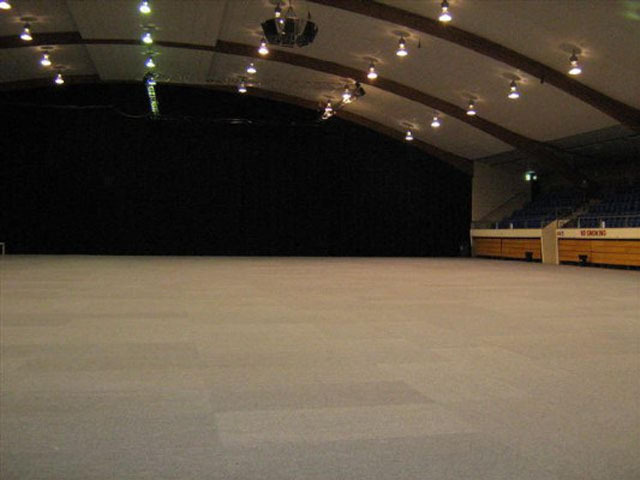 You can relax knowing your hall floor is protected by a durable surface which can handle tables, chairs, AV equipment, staging, and other equipment. SMARTSQUARE’s ingenious, technologically advanced floor covering is made from heavy duty polypropylene. Its hardwearing construction protects your hall floor from wear and tear from stiletto heels, chair dragging, accidental gouging and other occurrences that could ruin a hall floor. Durable SMARTSQUARE actually saves you money on floor maintenance and replacement costs. SMARTSQUARE is waterproof; with an impervious polyolefin backing that resists spillage and staining. If someone spills a glass of red wine on SMARTSQUARE, mop it up and it won’t show. SMARTSQUARE can be customised to fit any hall floor shape. Even irregular areas in your hall can be covered. And you can also easily replace any portion of SMARTSQUARE flooring if you should ever need to. Use SMARTSQUARE for the short or long-term. Installing SMARTSQUARE is easy – it’s an uncomplicated loose lay. The average community hall takes about 40 minutes to lay and is even quicker to remove. SMARTSQUARE is produced in a cost effective, environmentally friendly way. This makes it a surprisingly affordable and environmentally sustainable product for you to use on your precious town, school and community hall or business floor. Call now to see SMARTSQUARE for yourself – it really is Australia’s easiest and best floor protection system.